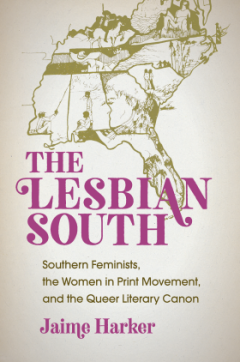 Jaime Harker’s Brown Bag Lecture on Wednesday, February 6 will be about her new book, The Lesbian South: Southern Feminists, the Women in Print Movement, and the Queer Literary Canon. Harker is a professor of English and the director of the Sarah Isom Center for Women and Gender Studies at the University of Mississippi, where she teaches American literature, LGBTQ literature, and gender studies. She has published essays on Japanese translation, popular women writers of the interwar period, Oprah’s book club, William Faulkner, Cold War gay literature, and women’s liberation and gay liberation literature.